Alexander, always known by his middle name David, was the eldest son of Alexander (1857-1923) Boyle. He was born at Otaio, South Canterbury, on 3 November 1887. His father Alexander had settled in Canterbury in 1870, and had married Fanny (1861-1930), a daughter of the well-known Studholme family. He came from a very well connected family. His first cousin was Sir Bernard Fergusson who was Governor-General of New Zealand from 1962-1967, and his grandfather was David Boyle, 7th Earl of Glasgow, also Governor-General of New Zealand from 1882-1897. Educated at Christ’s College (1898) and Wanganui Collegiate (1899-1900), David was in 1901, at the age of 13, a boarder at a private school, The Grange, at St Helen’s, Sussex, England. At the age of 16 he entered the navy training ship HMS Britannia for officer training, followed by sea training in HMS Auroa and HMS Illustrious. On promotion to midshipman, he served on HMS Diadem on the Channel Fleet, and later in HMS Powerful on the Australian Station. Later he served as a Sub Lieutenant in HMS Triumph with the Home Fleet, followed by a posting to the Royal Yacht Victoria and Albert, where he was promoted to Lieutenant. He further served on HMS Ships Blenheim and Donegal. When World War One broke out, he was serving on HMS New Zealand and saw action in the Battles of Heligoland Bight, Dogger Bank and Jutland. During the Battle of Jutland he commanded X turret which held two 12 inch guns. The ship received a direct hit near this turret and for his conduct in this action, was Mentioned in Despatches. He was also awarded the French Croix de Guerre with palms for service in these three actions. From 1917 to 1918 he served as second in command on HMS Birkenhead in the North Sea, but re-joined HMS New Zealand after the Armistice, spending time cruising round the Empire with Admiral of the Fleet, Viscount Jellicoe. 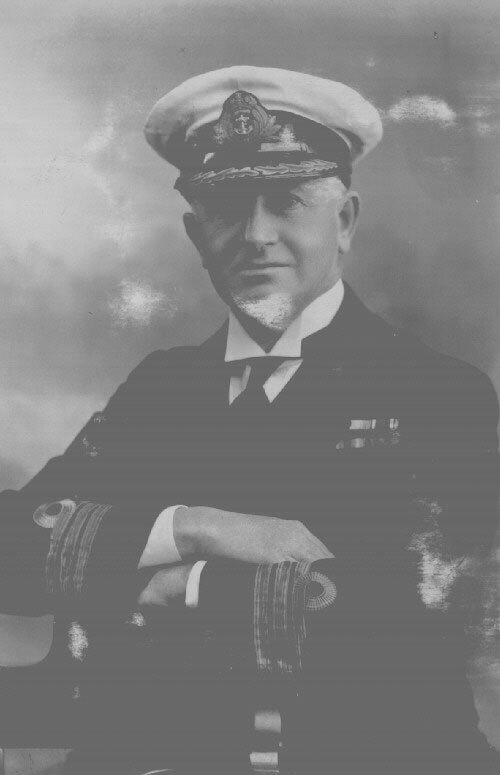 He retired from His Majesty’s Navy in 1920 with the rank of Commander, and is the only known New Zealander to have served at all three major naval battles of World War One. After leaving the Royal Navy David returned to Christchurch and began work in the office of livestock company, Pyne Gould Guinness Ltd. His father, Alexander senior, along with Mr FH Pyne, had established the firm of Pyne & Co in 1887. They amalgamated in 1919, with Gould, Beaumont & Co and Guinness & LeCren, to form the new company, Pyne Gould & Guinness Ltd (PGG), with their chief office in Christchurch. His father remained a director of this new company until his death in 1923. Alexander remained with the firm in Christchurch for some years. When the Canterbury Division of the RNVR was formed, he was appointed the first Commanding Officer, with the rank of Commander, and held this appointment until retiring again in 1934. He transferred to Timaru in 1930s and took up the position of Sub-Manager and Director for PGG, before retiring in 1935 to commence farming at ‘Birchbank’, Orari, but remained a director of the company. Here he was a leading breeder of Friesian cattle, Tamworth pigs and later bred Romney Marsh sheep. David was again called for service during WWII and was appointed as Naval Officer in Charge at Lyttelton, with the rank of Commander. In 1940 he was re-appointed as Staff Officer for Technical and Material Duties where he was responsible for the requisitioning of vessels, and fitting them out for minesweeping duties. 1943 saw him taking up the appointment of Naval Officer in Charge at Wellington where he remained until 1945, before being demobilised and retired for the third time, this time with the rank of Captain. Alexander took an active part in the community and was an elected member of the Timaru Harbour Board from 1950 to 1962, President of the Temuka & Geraldine A&P Association, President of the Navy League (Canterbury Branch), and was also well known in the racing industry where he raced three horses, and was a member of both the Canterbury Jockey Club and Geraldine Racing Clubs. After a short illness, David died at Timaru Hospital on Tuesday 31 January 1965, and was buried with his sisters, Phyllis Montgomerie Boyle and Janet Williams, in St Peter’s Anglican Churchyard, Upper Riccarton. In true naval fashion, he was laid to rest in an oaken casket fitted with rope handles. His parents Alexander and Fanny are also buried there. For his various services David was awarded the 1914-15 Star, the British War Medal 1914-18, the Victory Medal 1918 with Mentioned in Dispatches, the Defence Medal, the British War Medal 1939-1945, the New Zealand War Medal, the George V Silver Jubilee Medal, the Croix de Guerre with Palm (France), and the Legion of Merit (Degree Officer) (USA). His brother Alistair Patrick (1905-1973), known as Paddy, served in the same battalion during the Second World War, with his friend and neighbour, the famed Charles Upham VC and Bar. The National Museum of the Royal New Zealand Navy has Captain Boyle’s cigarette case which bears the double-headed eagle crest and engraved with the motto Dominus providebit (the Lord will provide).